A visit to Mandy’s work space/living space in Berkeley, CA was exactly what I hoped it would be. She was a gracious host, accommodating my almost-due pregnant friend Mary and her cutie-pie 16 month old boy with a charming ease. Mandy served us delicious tea that she perfumes herself, let us dawdle in her vibrant garden, and of course guided us through her dazzlingly extensive perfumer’s organ. Our meeting was a last minute plan and just to add to the extemporaneous feeling of that morning, Avery Gilbert was leaving as we walked in. Yeah, that Avery Gilbert of What the Nose Knows. He too was incredibly kind and considerate and I almost asked Mary to pinch me as I stood amongst Mandy’s books and fragrances while chatting up Avery Gilbert. As he left, Mandy proceeded to make us tea. One was an oolong infused with jasmine and mint, the other an oolong perfumed with hojary frankincense. 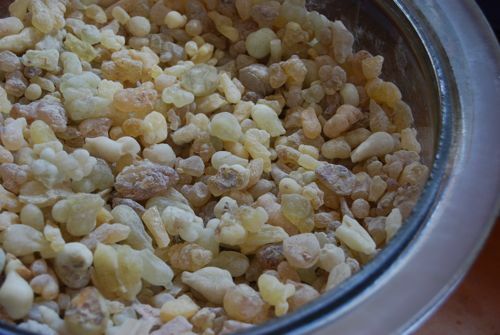 A large glass bowl, as big and round as a sink basin, was filled with hojary frankincense from Oman that beckoned me with its resinous radiance. 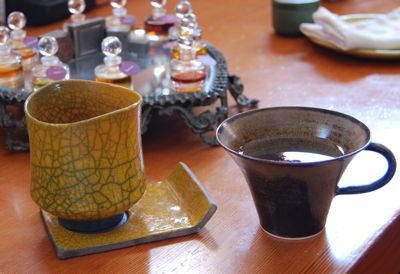 With a slow genuflection, I lowered my head and took in its aroma while Mandy let the jasmine and mint tea steep. I love jasmine infused tea. I have had many different kinds, and can’t get enough of its floral taste and smell being experienced simultaneously. Not until sipping Mandy’s jasmine and mint tea though, have I ever experienced the indolic nature of jasmine in a tea. It was bold and sensual and instantly relaxing. Mandy chose to blend the jasmine with mint absolute in order to cool the jasmine and play with its indolic edge without eclipsing it. For this reason, mint absolute was chosen over mint essential oil, which would have taken over the floral quality. The mint absolute is rounder, and like jasmine is a middle note, as opposed to mint essential oil which is a top note. As a result, they work in concert with each other, complimenting each other even though jasmine is the more prominent aroma. Mandy also brewed her GABA oolong that is scented with her hojary frankincense. It’s called GABA because this particular oolong is grown to enhance its GABA content, a neurotransmitter that has a relaxing, anti-anxiety effect. Its taste was smooth and delicately aromatic, and definitely calming. As we sipped tea, Mandy had me smell essences from different sources. For instance I smelled the mint absolute and the mint essential oil, and as Mandy described, the absolute was not sharp in the slightest. It was round and warming and incredibly beautiful. I smelled sandalwood from her new, sustainable source in Indonesia which was buttery and smooth as compared to her vintage Mysore sandalwood which smelled of an antique drawer filled with stories for days. 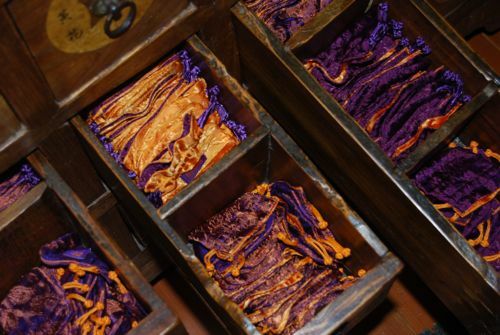 Mandy has a gorgeous chest of drawers filled with her perfumes and colorful pouches that house those fragrances. (I’m sure this chest has many of its own stories to tell!) These pouches are made in Vietnam by disabled craftspeople, and Mandy has worked with this organization to achieve the details she wants in these lovely pouches, down to the size of the strings to the type of knot she prefers. 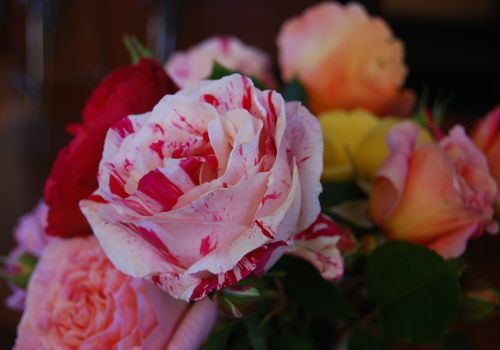 Aesthetic details clearly mean a lot to Mandy, and this is evident in her garden overflowing with roses. The roses were stunning, and I could have spent all my time at her studio learning about the varieties and their origins. They were all incredible, but my favorite was the Golden Celebration Rose which was particularly noteworthy due to its golden hue, like that of an antique brocade. But what was most memorable, was Mandy herself. Her humility and wealth of knowledge are admirable. She is also very earnest in her desire to connect with her customers. She has recently entered the world of Facebook and Twitter and is enjoying how it enables her to make those connections. Emails are palpably important to her. She responds to every email (and comment), and feels very strongly about maintaining that relationship with her customers. She wants to know how people respond to her work, and what her fragrances mean to them. Additionally, she exudes contentment and pure joy in her work and her business. In her own words Mandy states, “I’ve gotten to do what I want to do, on my own terms. I have resisted growing my business too big because I like the whimsical nature of being able to create what I want to create, while also enjoying being in control of every aspect of Aftelier Perfumes. I couldn’t imagine doing anything else that would be better, for me.” Amen to that. Below is a sneak peek at the new Aftelier website which is aesthetically lovely, and most importantly, easy to navigate. Mandy’s revamped site will be launched soon and I will keep you up-to-date on that. I met Mandy 2 weekends ago here in Seattle. She was gracious and fiery while being kind to all who complimented her. I was thrilled to talk to her and express my passions about perfumery and where I was heading. I would love to visit her studio. Thanks for the glimpse into her lovely workspace and home. Looking forward to seeing her new site up! That is so wonderful you were at the Essenza event! I read all about it on Nathan Branch’s blog. Take a trip to Berkeley, the neighborhood Mandy lives in is incredible! That’s a collection of delights in one partial day…the tea…the company…the garden…the perfume talk. I also notice among the details the antique prints on the wall by the organ — whale for ambergris? a civet? They, too, are aesthetically pleasing and add to the ambience…while, I am sure, carrying extra meaning for the inhabitant. I really want to reach my hand in that bowl and stir the frankincense — just a little bit..
It’s always interesting to me to have a chance to go into an artist’s space; thanks for taking us along. I got to smell real civet for the first time. Wow! That is some intense secretions, my lordy. I never knew the true meaning of “animalic” until I smelled it. Alone, it was too much for me, but I can imagine a little drop in a fragrance makes it bloom like crazy. Mandy does not use civet in her perfumes, ambergris and hyrax are the only animal ingredients she uses. But her personal collection is full of all kinds of potions. Amazing! 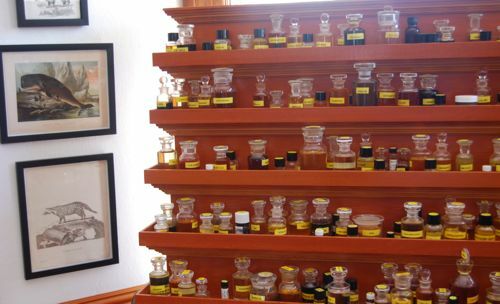 You’re so very fortunate to have experienced the magic of Mandy’s home and garden and, of course, an in-depth exploration of her perfumer’s organ and hidden treasures. Indeed Anya, I feel very fortunate that it all worked out. 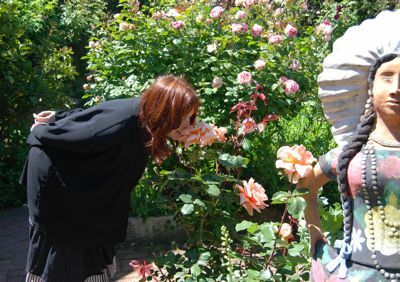 Trish — Such a great write-up of your visit to Ms. Aftel’s studio, and I’m happy to read that you had the chance to meet with her, chat and learn first-hand about her laid-back approach to boutique perfumery (and tea!). 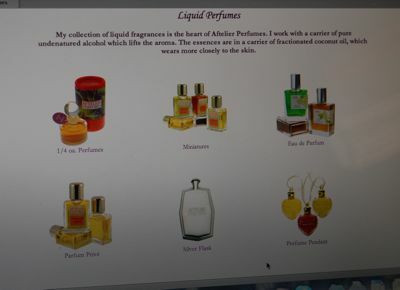 I didn’t know that the Aftelier perfume pouches were made in Vietnam by a group of disabled craftsman. That’s a beautiful testament to Mandy’s commitment to source out the kind of work that gives back as much as it takes — and the pouches are truly lovely, to boot. Thanks so much! I was thrilled to read your article about the Essenza event so I am glad it all came together for me to meet Mandy in her studio. Her place is gorgeous, and is in a fabulous neighborhood, a stone’s throw from Chez Panisse! Wow, what a fantastic experience! A complete immersion for the senses, and Mandy sounds like such a wonderful person too. 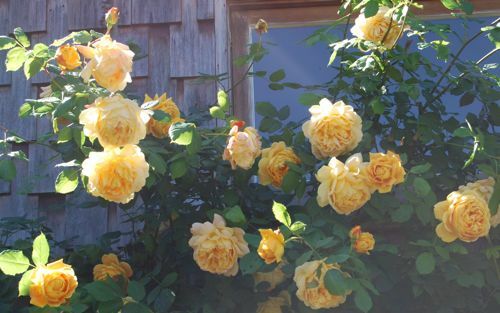 I have that golden Celebration rose in my own garden, it’s one of my favorites, so fragrant and such a gorgeous color. AHhhh..just sitting here taking in your experience to the extent that I can :). This would be the ultimate of experiences for me!! I hold Mandy in the highest regard. Thanks for sharing this one! Thanks for reading Dabney, I’m so glad you enjoyed it! This is the main reason I have stayed away from her perfumes–use of civet is just not okay with me. Mandy might have used civet at some point, and might still in her personal perfumes, but she was very clear with me that the only animal ingredients she uses in her perfumes are hyrax and ambergris. Thanks, Trish, I was concerned after I read her extensive praise of civet, and her instructions on using a tincture of it. One of the things I like most about your site is your “greening the hive” section with research on what to avoid in products–so helpful! I hope all your readers avoid products with civet–the way it is gathered is truly abusive, and who needs that in their lives!